Doha (AFP) – On the first anniversary of a bitter Gulf diplomatic rift, Qatar’s foreign minister on Tuesday declared his country stronger than ever and said it was open to dialogue with its regional rivals. Mohammed bin Abdulrahman Al-Thani also rebuked Qatar’s foes for “imaginary victories” against the small Gulf state, the target of a Saudi-led boycott. “One year on and Qatar and its people are stronger,” Al-Thani, one of the most prominent voices in the region’s worst diplomatic crisis for years, wrote on Twitter. On June 5, 2017, a Saudi-led alliance including the United Arab Emirates, Bahrain and Egypt abruptly severed ties with Qatar, accusing it of supporting terrorism and Iran. 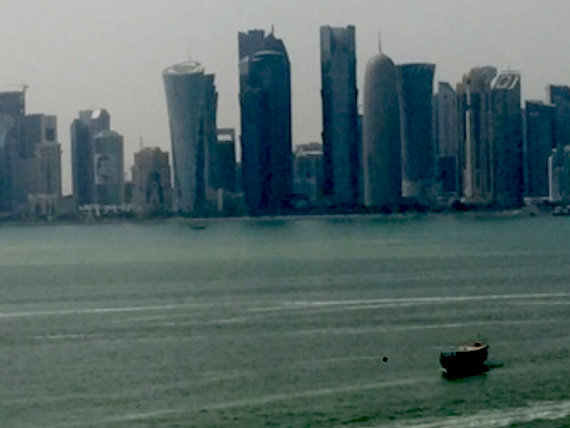 Skyline of Doha, Qatar from the Islamic Art Museum. By Juan Cole..
Qatar soon found its only land border closed by Saudi Arabia, its state-owned airline barred from using neighbours’ airspace, and residents expelled from the quartet’s countries. Despite hopes that the rancorous rift between the former allies — which include some of the richest countries on earth — would be resolved quickly, the crisis has endured. Diplomatic efforts led by Kuwait and the United States have so far stalled though there are tentative plans for talks in September. Al-Thani said the “door is still open for dialogue” between the Gulf rivals. However, he also told Qatar state-funded broadcaster Al Jazeera on Tuesday that Doha would continue with its purchase of the Russian S-400 air defence missile system. Saudi leaders have asked French President Emmanuel Macron to intervene to prevent the deal going ahead, raising fears of military action in the dispute. Raising the military stakes yet further, Qatar’s defence minister Khalid bin Mohamed Al-Attiyah, said Tuesday that Doha wanted to join NATO. Despite the impact of the crisis, many in Qatar view the past year’s events as a victory for Doha. Qatari papers were jubilant on Tuesday, with headlines such as “Triumphant Qatar stays united” and “Qatar shines as smear campaign against it fails”. Taxi companies offered customers free rides and some in Qatar have even called for June 5 to be made a national holiday. Meanwhile, Qatar’s National Human Rights Committee (NHRC) released a report claiming more than 4,000 human rights abuses had been committed against Qataris by the Saudi-led alliance in the past year. Qataris have been exposed to arbitrary arrest and routinely denied freedom of movement, according to the report by the government-appointed body detailing alleged abuses including one case of forced disappearance. “From the beginning, all the blockading countries have tried to use the people to achieve their political goals,” NHRC chairman Ali bin Smaikh al-Marri said. There was no immediate reaction from the Saudi-led bloc. In August, Saudi Arabia will welcome millions of Muslim faithful for the hajj pilgrimage to Mecca, the holiest city in Islam. The Saudi government on Tuesday confirmed Qataris wishing to undertake the umrah pilgrimage to Mecca were welcome, but accused the Qatari authorities of a “negative attitude”. Since the start of the crisis, Qatar has accused Saudi Arabia of politicising religious pilgrimages to Mecca, including the hajj, one of Islam’s five pillars, which every able-bodied Muslim who can afford the journey is obliged to undertake at least once. Featured Photo: AFP/File / KARIM JAAFAR. 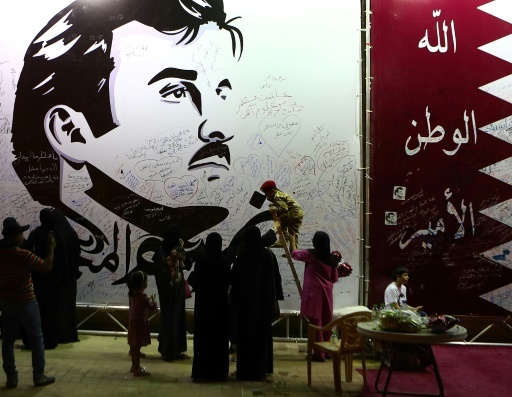 Qataris write comments on a wall bearing a portrait of Emir Sheikh Tamim bin Hamad Al Thani on July 06, 2017.